Well, nine months. 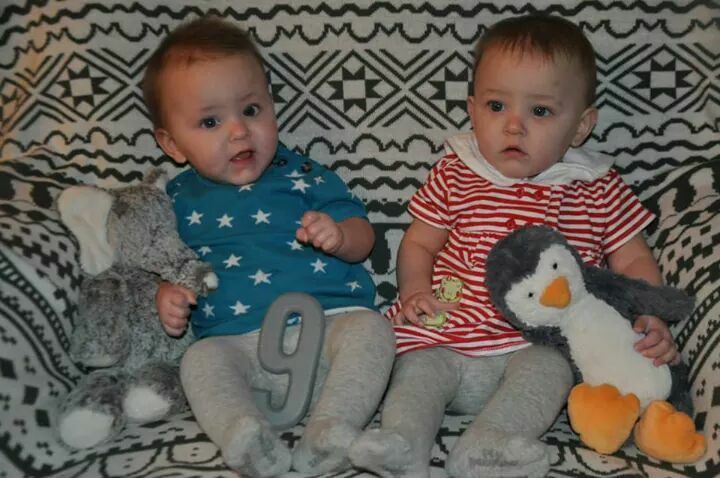 Nine whole months of having two sweet baby girls as part of our family. I can’t believe that so soon it will be their first Christmas and then first birthdays! Of course, the girls are about six and a half months corrected, but I have to say, they’re doing phenomenally. Raegan is thisclose to crawling. She scoots a bit up on her hands and knees. She can fully sit up by herself but hates it as it means being stationary, and Miss Raegan just does not do that. She loves toys. Loves, loves, loves them! It’s time to lower the cribs because she’s starting to get into everything and pull herself up. Ella is doing well. We got the BEST news that she does not need to have brain surgery, and I mean, what could possibly top that? She’s rolling more from side to side and now she can pass toys between her hands. Her physio even said that she’s for sure getting stronger. Yesterday, I gave the girls lunch; pieces of toast, turkey, banana, and cheese. It was like a light lit up in their lives. Ella, in particular, loved the turkey. Raegan tried to repeatedly cram toast in her mouth. We’re getting close to completely getting rid of purées and moving forward to real food. Yay! In just a few weeks, the girls will celebrate their first Hallowe’en with their big brother! This entry was posted in Baby love, Baby update!, Home is where the heart is and tagged development, milestones, momo, mono mono, NICU, preemies, twins. Bookmark the permalink.